At one point, UFC 148 was challenging to be one of the promotion’s most star-studded lineups of all time. However, the July 7th roster took another major hit Saturday afternoon when the interim bantamweight title bout between Urijah Faber and Renan Barao was removed from the card and promoted to UFC 149‘s new featured attraction. 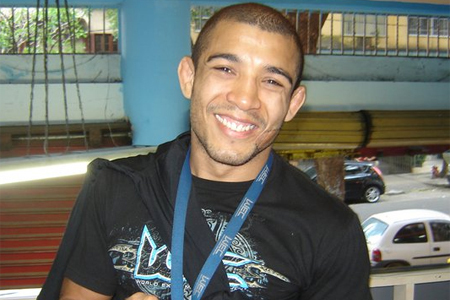 What happened to the featherweight affair with champion Jose Aldo (Pictured) and Erik Koch that was slotted to headline the Octagon’s return to Canada, you ask? Well, it was postponed after Aldo became the latest fighter to get stung by the relentless injury bug. The UFC didn’t announce what wound forced Aldo out of the July 21st tango or how long he’ll have to ride the pine. Aldo now joins the likes of Vitor Belfort, Thiago Silva, Thiago Alves, Brian Stann and Michael Bisping to get hurt while training since late last month. Fellow champions Georges St-Pierre and Dominick Cruz are also presently on the UFC’s IR list. The organization didn’t report which fight would now serve as UFC 148’s new co-main event. Based on the card’s current bout order, the light heavyweight trilogy between Tito Ortiz and Forrest Griffin will get the nod. Scotiabank Saddledome in Calgary, Alberta, Canada hosts UFC 149.